Hi and welcome to Red Couch Recipes and my San Francisco's Chinatown inspired table. Also Welcome to Tablescape Thursday. 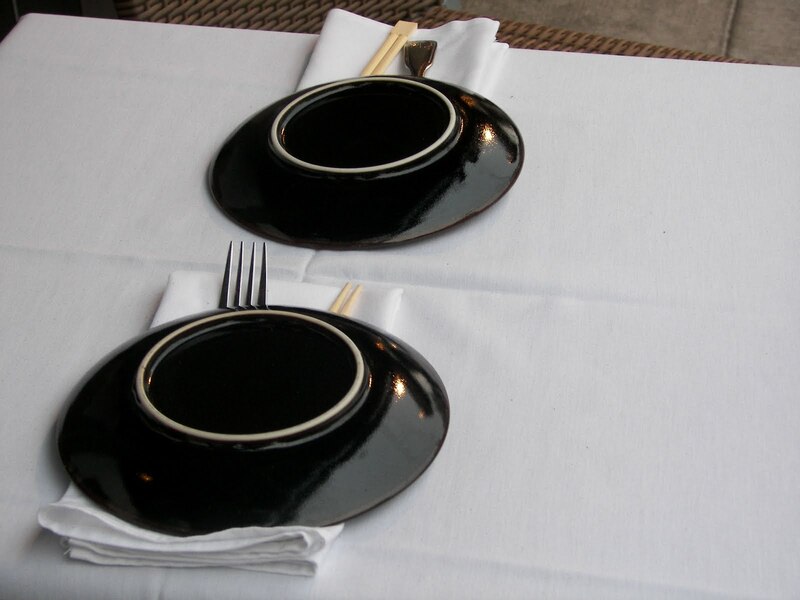 The picture below is of a sidewalk tablesetting at an Asian restaurant, not in Chinatown, in the Cow Hollow district of San Francisco. I liked the upside down plates. This is the placesetting. I like the floral salad plates with the black and white napkins. What do you think? The color red, has great significance to the Chinese people. There is even a very vibrant red called Chinese Red. I don't really specialize in centerpieces, but I put this together with some Barberry from the bushes in our backyard. I think the branches of the bush look a bit Asian. Here's a sideview of the tablesetting. My husband and I are pretty good at using chopsticks. How about you? When we were dating we had "our" restaurant -- Tu's Hunan in Sacramento. We had our wedding luncheon there. Tu's Kung Pao Chicken and Moo Shu Pork were excellent. Unfortunately, we found out that the restaurant had a fire and is no longer in business. Here's the view of the light shining through the red glasses. 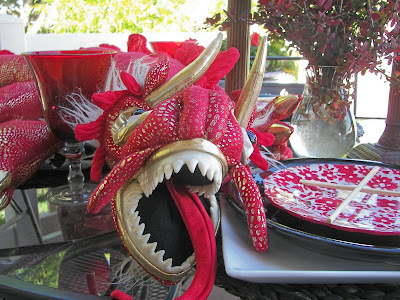 My sister Jacqueline -- Purple Chocolat Home --gave me this Chinese dragon puppet years ago. When I was in college Jacqeline and I used to be into a Chinese cooking phase. We would get together and whip up a great Chinese feast in no time at all. Someday I will post one of our favorites -- a lemon chicken dish I have been making for years. I have been in San Francisco's Chinatown during New Years. It is quite a treat to see the huge New Year's dragon come by. It is a very festive occasion. I bought the brass Chinese character wall hangings years ago in Chinatown. 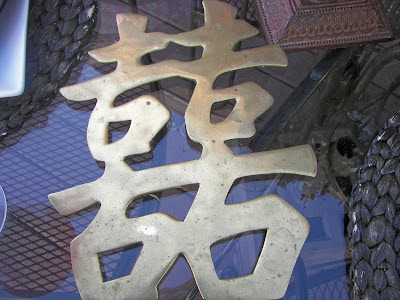 The characters mean "Double Happiness." I DO wish you "Double Happiness." This character is often stamped on traditional Chinese wedding invitations. We served Chinese Almond Cookies tonight. We were not really thrilled with Chinese bakery goods in Chinatown so I came home and made some cookies. Click here for the recipe on yesterday's blog entry where I show the sights of San Francisco's Chinatown. My son can't wait until after dinner to eat one. 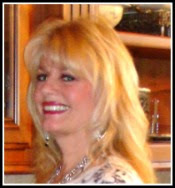 I thank you for taking the time to visit me today at Red Couch Recipes. Like the Chinese, I love the color RED! Wow!! So beautiful and fascinating!! Thanks for sharing. I love all the red!!! I love the black, white and red. Your centerpiece is perfect. I am so ashamed because I have never mastered chopsticks!!! I am going to check out the recipe for the cookies now. Love almond cookies. Remind me of when I was a kid. Your blog is beautiful. I'm following you back. Hope you come back soon. The table is gorgeous and that puppet really makes it! I love the red and black combination. I actually have an entire set of Asian dishes and they are all red and black. I have them on Craig's List now but there isn't much demand for them here and while I love the way they look on the table, I just don't cook or serve Asian foods. My husband doesn't like them. So, I get my cravings met with take-out or in restaurants. I can't bring myself to serve burgers or chicken casserole on my Asian dishes! That centerpiece is perfect for that table. It looks like a fine Chinese restaurant. I see you are a Jan Karon fan! Love her. Have we talked about this? There are so many Bloggers who read her. I love the puppet and the color and the dishes.. and just simply all of it. Done perfectly and so beautiful to see. Too cute! Our oldest daughter went to college in San Francisco (downtown) and her first apartment was one block from Chinatown. What a wonderful puppet! I love your table today. We enjoyed chinatown in San Francisco years ago -- I would love to have the opportunity to visit again. Beautiful! That dragon puppet makes the table! Thanks for sharing ... and sharing memories of a favorite restaurant! It's very creative Joni. 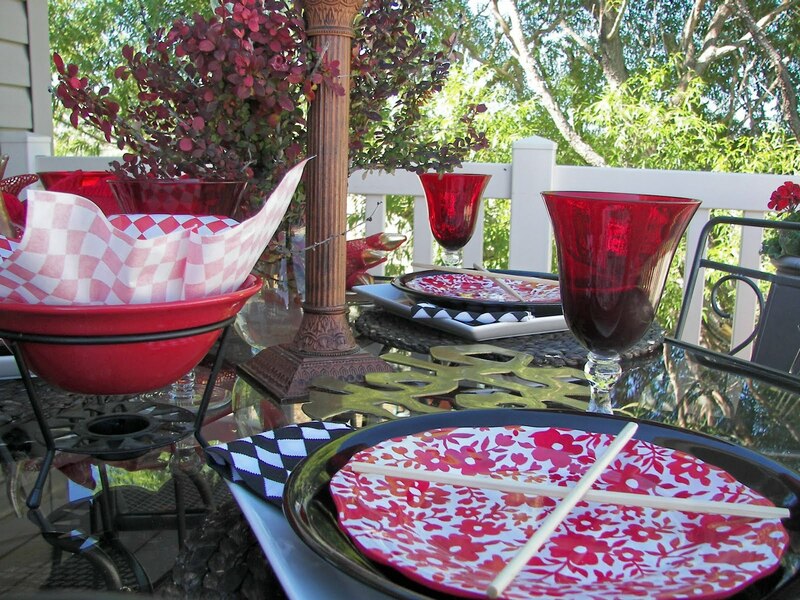 Love you pretty dishes and the bright red accents, goblets especially. 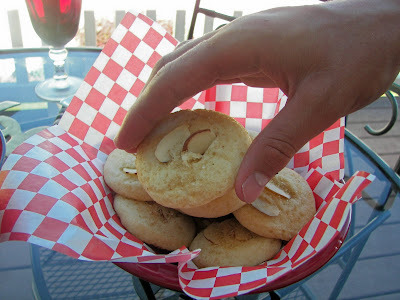 The almond cookies are so yummy, one of my favorites. Thanks too for the recipe. Joni, I am loving the dragon!! 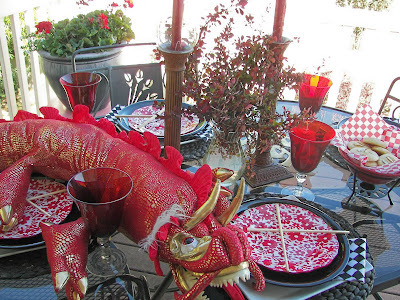 What a fun tablescape you put together. So creative, colorful and fun! I really like your table, Joni. I like the square white plate topped by the black plate and then the floral. It looks nicely coordinated. 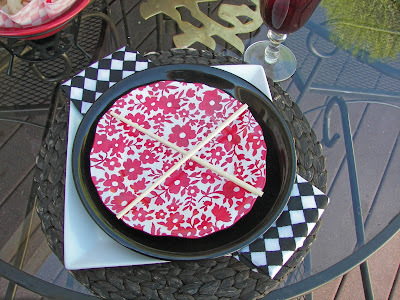 The checked napkins look great along with these. I am fair with chopsticks; I think I need more practice! Have a great week! Your sister!! How did I miss that??? I love her blog too! Small world! This is a gorgeous table, and very unique. Love the red, of course, too!! 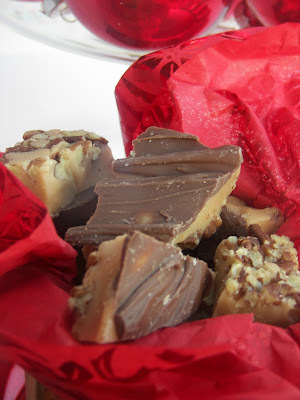 Thanks for posting about the giveaway!! Oh, I really like this! So unique! 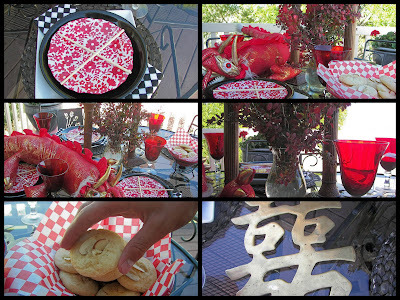 I don't think I've seen a Chinese theme tablescape, a first! Nope, I can't use chopsticks! We do like Chinese food though. 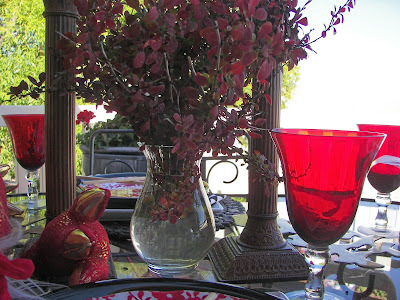 This is what I consider a happy table, makes me smile with all that red! Oh, this is beautiful and it was fun to see the table from your trip. 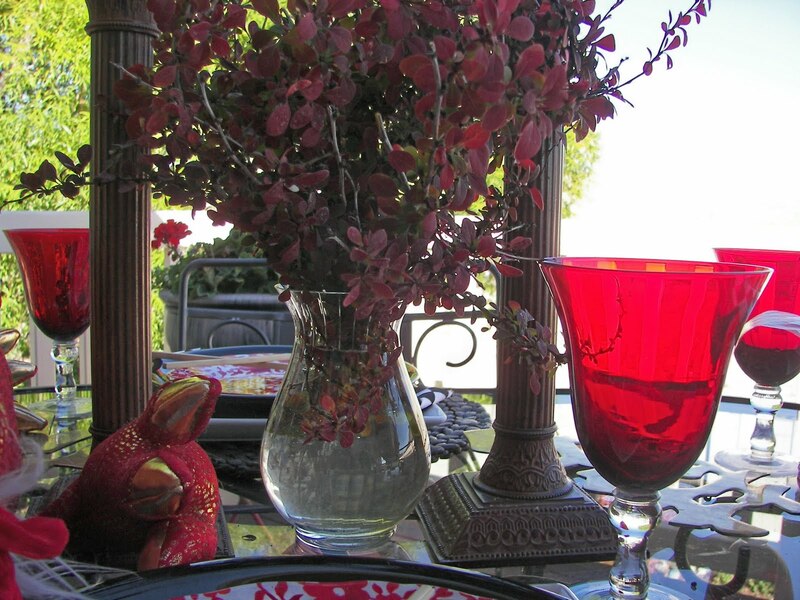 The colors of your table are fabulous. I can't believe you did this with company coming. I almost didn't but wanted to do mine before summer ended. I adore the red dragon and you did a great job on the centerpiece, that was a very clever addition. The cookies look great too. The relatives weren't supposed to be there until tomorrow and they weren't spending the night when I last talked to them. Glad they could and that you could make the yummy Fennel Pork. We loved it. 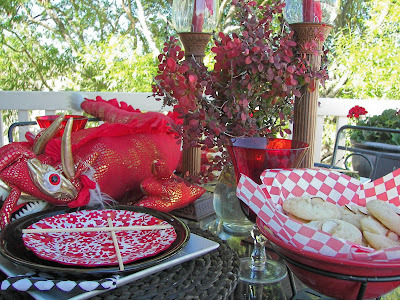 What a colorful fun table-enjoy! What a bright and colorful setting, it's just as charming as can be and fun! What a fun and festive tablesetting! I love all the authentic touches, especially that great dragon puppet! What a unique table! That dragon is just perfect. I love all the reds. the pops of red really make this so fun!